Since we spend a lot of time in the kitchen, we are always getting gifts of produce. We love getting produce. The problem is, most of the time said produce needs to be dealt with expeditiously. And we are not always expeditious. Last week, we got large bag of jalapenos. My friend, Art, is friends with the boys that run the farmer's market and he rarely misses a trip. It is his one weekly outing. After pickling several jars, Art left the rest of the bag for me. 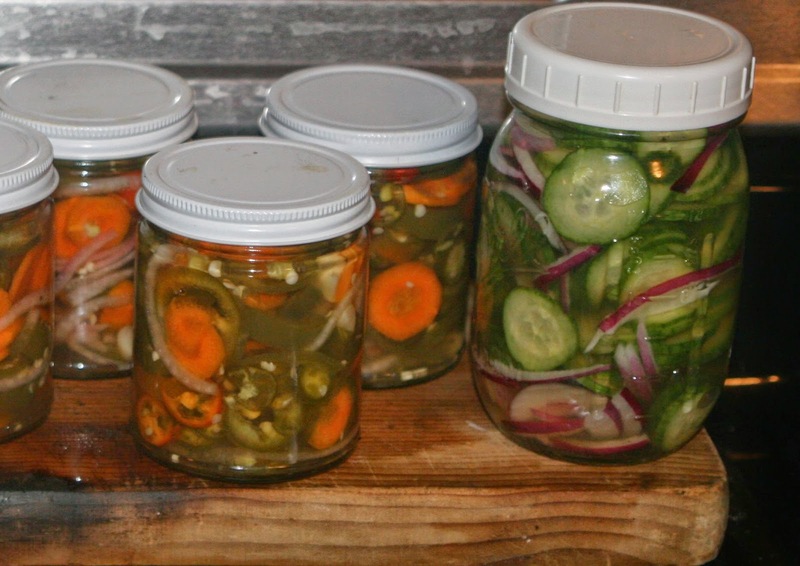 Every time we pickle, we go through the same process: we look at 15 or 20 recipes and are happy with none. Seriously, a brine is vinegar, water, salt, a bit of sugar, some spice. It's not rocket science. Making refrigerator pickles is simple, but the abundance meant that we would have to process them, as there is no way to eat that many peppers in a few weeks. We sliced the jalapenos, onions, carrots, and chopped several cloves of garlic. We ended up with about six cups of cut vegetables. Place everything in a non-reactive pot and bring to just boiling, stirring to make sure the sugar and salt are dissolved. Pack the vegetables, tightly, into sterilized jars. 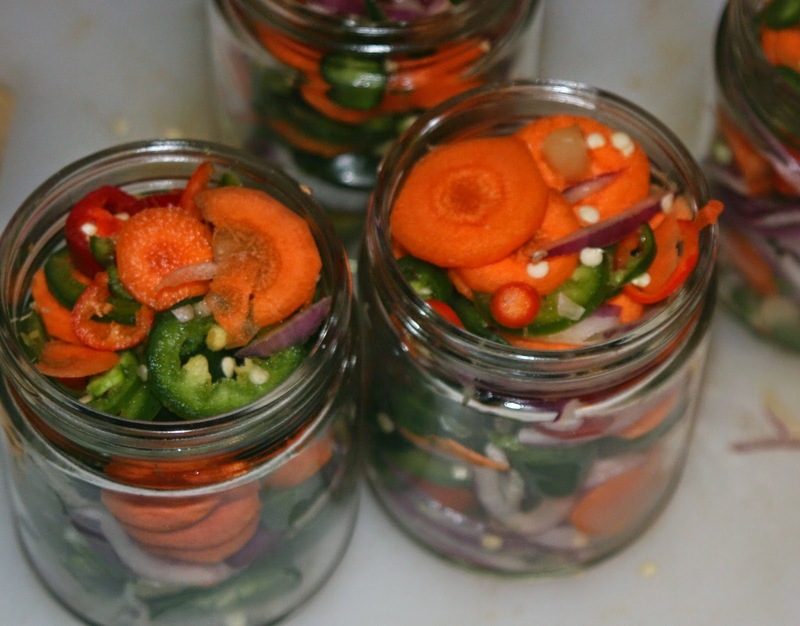 Pour the hot brine over the vegetables, leaving a 1/4 inch of heard room in the jars. Place the lids on the jars, and hand tighten. Process in a water bath for 10 minutes. With every recipe, there is a brine and with every recipe, there is almost, always, too much brine. (Actually, too much brine is a lot better than trying to pickle something and finding out there is not enough brine.) The great thing about a brine is that one brine can brine most anything. We had our bowl of jalapenos, carrots, and onions. We made the brine. Filled sterile jars, poured the brine and sure enough there was about a cup left. We let the brine cool, as the jars processed. In a pint jar, we stuffed slices of cucumber and red onions. Poured the remainder of the brine over them, and in addition to the canned jalapeno peppers, we had a jar of refrigerator pickles, too. Just made pink pickled watermelon rind pickles.